Free .MP3 download of DJ Blayne's remote-set. What is Turbo Drive? A retro-futuristic night of non-stop retrowave, dreamwave, outrun electro, and neo-electro-pop - Modern artists revisiting and re-imagining the futuristic electronic sounds of the 80s. Think Blade Runner meets Miami Vice. Did you like the soundtrack to the movie Drive? We can't get enough of that. Fast Cars, neon lights, and robocop. 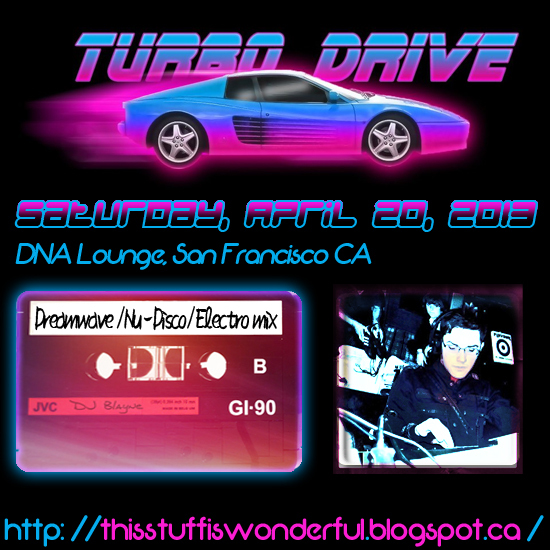 For an interactive 360 Panoramic view of the venue TurboDrive is playing in, visit here. Spinning artists like: Kavinsky, Cut Copy, Barretso, Lazerhawk, Com Truise, Neon Indian, Chromatics, College, Anoraak, Electric Youth, Miami Nights 1984, 80's Stallone, Tesla Boy, DVAS, Futurecop!, The Outrunners, FM Attack, Flashworx, Mitch Murder, Noir Deco, Garth Knight, Power Glove, Protector 101 and much much more!